If you ever find yourself in the situation of being at the mercy of using a crusty club mic then you're going to want to know about Mic Check Mic Wipes. Because god only knows where one of those things has been. You may have even improvised and gone as far as to pick up a box of GASP chemical laden Kitchen wipes to do the job. Thanks to Mic Wipes you no longer have to ingest green crusties or chemicals. 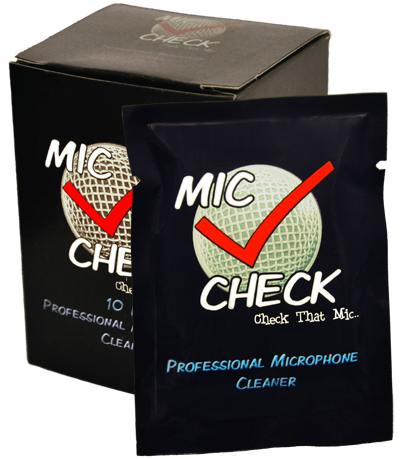 Mic Wipes are a specially formulated single use packet cleaning and disinfecting wipe designed just for your microphone. According to the company Mic Check Mic Wipes have a higher alcohol content of 70% than normal wipes which is effective at killing 99.9% of all germs. Unlike chemicals in other wipes the Ethyl Alcohol used in Mic Wipes is completely safe so there is no concern of inhaling anything toxic to your body. In addition, the wipe material used is a more porous material which is better suited at cleaning all the crevices of the microphone grill. I found Mic Wipes to be fairly effective in not only cleaning the grill but the body of the mic as well. There is enough moisture in a single wipe to easily clean the average handheld microphone such as a Shure SM58 with enough left over to go wipe off something else sitting nearby which over the course of my review I found myself compulsively doing. Everything cleaned with Mic Wipes is left with a subtle yet fresh minty smell.